After the South America Garchen concluded, the Sakyong spent a couple of days exploring the magical port city of Valparaiso. He then went to Santiago for the two final events of the campaign. 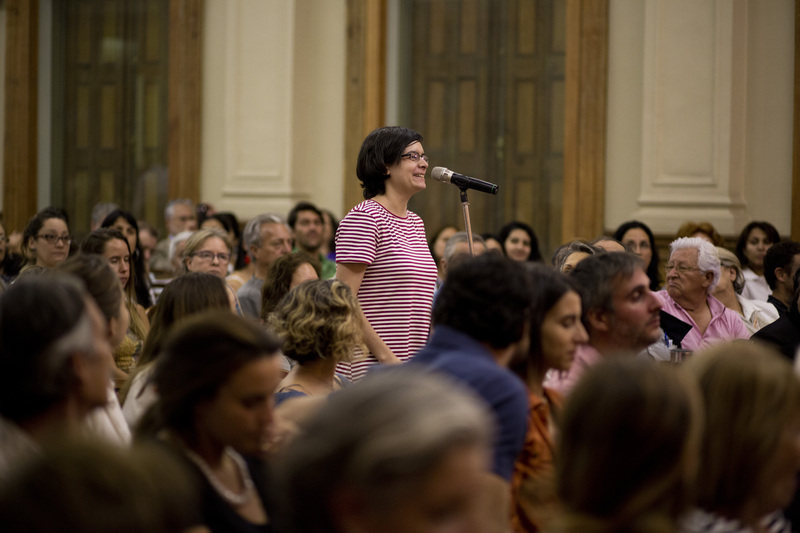 The first was a public talk held at the Universidad Catolica, one of the most prestigious institutions of higher learning in the country. Located in the heart of the bustling capital, in the middle of summer, it was difficult to foresee how many people might attend this talk. The coordinators and the Chilean sangha put a lot of effort into creating an uplifted, warm, and magnetizing environment for the Sakyong to offer teachings, but what manifested as a result surprised everyone. The university hall had a maximum capacity of 350 people, which filled up well before the scheduled time of the talk. 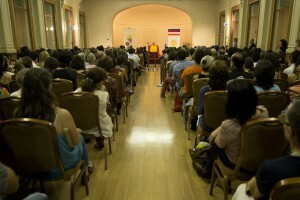 When it was clear that the turnout would be beyond expectations, almost all the members of the sangha generously offered to give up their reserved seats. Even after that gesture, 50 more new people decided to sit in the hallway to listen to the talk. The Sakyong delivered a powerful message on enlightened society and the lineage of warriorship to a crowd of sophisticated, thoughtful, and very open individuals who were hungry to take these teachings into the world. 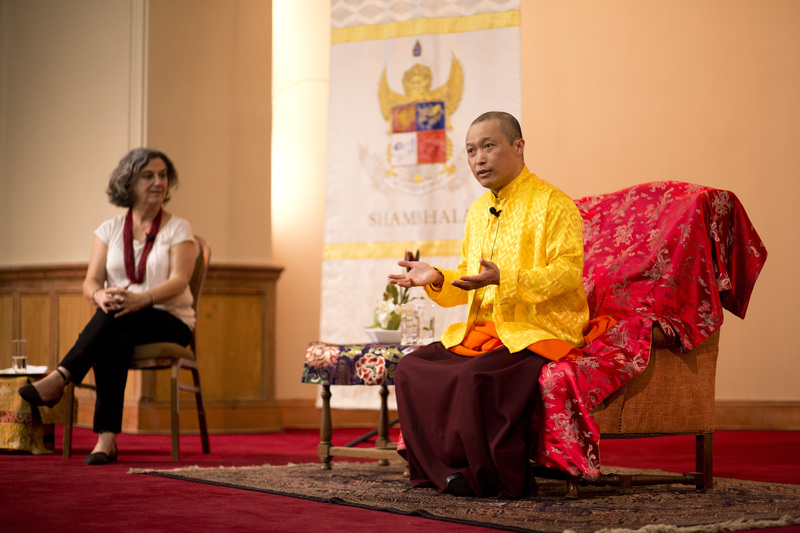 The following day, the Sangha hosted an evening for the local Shambhala community in the beautifully transformed gymnasium of an elementary school that some of the Shambhala children attend. 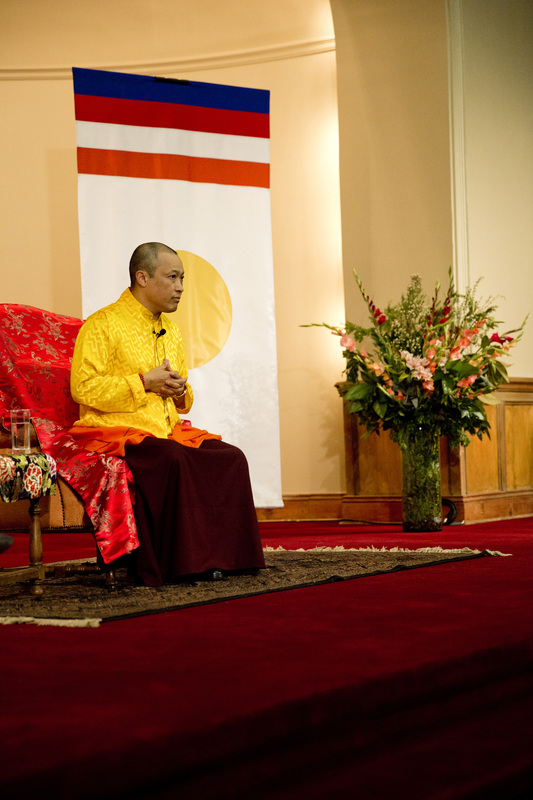 The event, in which over 300 people participated, included a recap of the Concumen retreat by the Acharyas, and a talk with guided Shambala meditation by the Sakyong. At its conclusion, he shared his profound love and appreciation of the Chilean community not only for hosting him so elegantly, but also for their commitment to continue cultivating the vision of Shambhala in the future. The Sakyong put forward marching orders for the sangha to contemplate, integrate, and enact as a strategy of devotion to establish the kingdom of Shambhala in South American and that will bring the Sakyong — and hopefully his family! — back to Chile again and again. Thank you for sharing! It’s fantastic to learn about the gatherings in many countries with the Sakyong!